Over in Victoria yesterday, the pupils of Westminster School were enjoying sport in the autumn sunshine upon the superior grass of Vincent Sq. 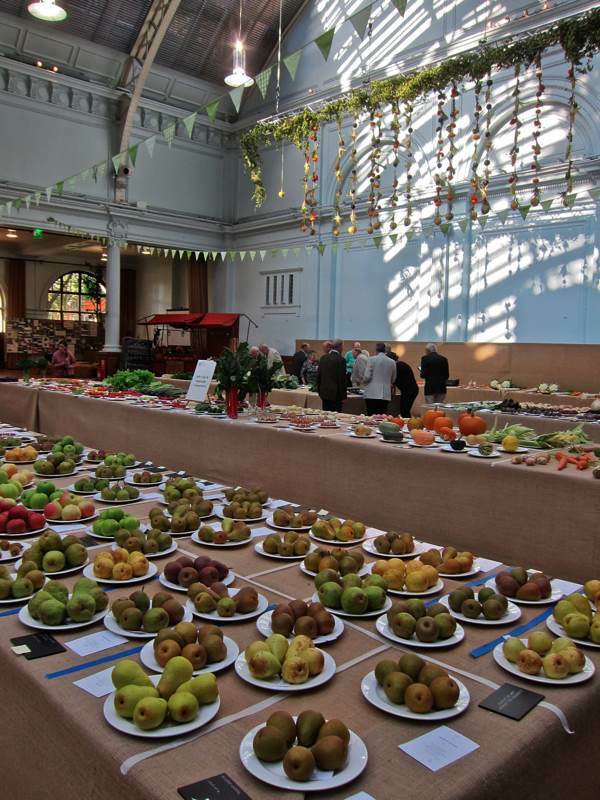 While, inside the Lindley Hall that overlooks the square, immaculate fruit and vegetables lined the tables of the Royal Horticultural Society Harvest Festival, illuminated by that same October sunlight descending in shafts through the decorative Edwardian vaulted glass ceiling to majestic effect. 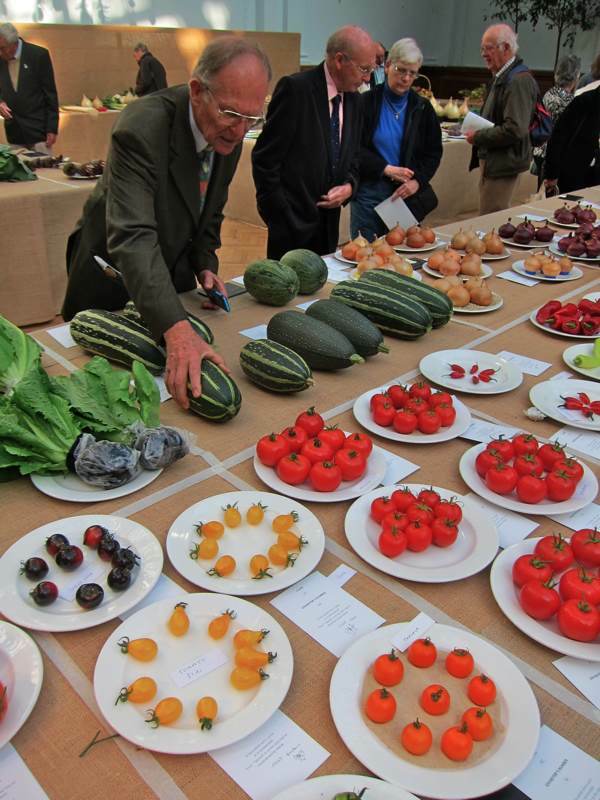 It has been a wonderful summer but now the time is come and the fruit and vegetables are gathered for us to savour. 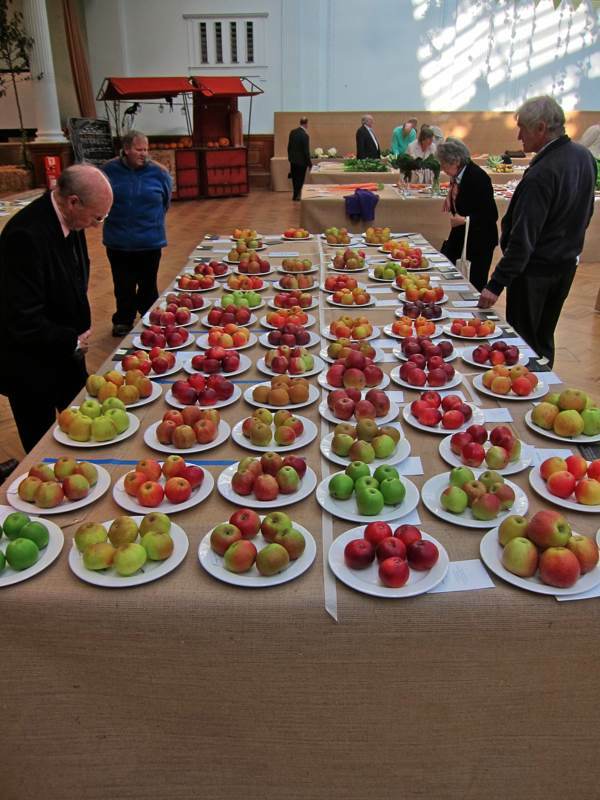 I arrived at opening time to encounter the fragrance of ripening apples filling the hall, where judges were still deliberating over produce and growers still tweaking their impeccable displays. 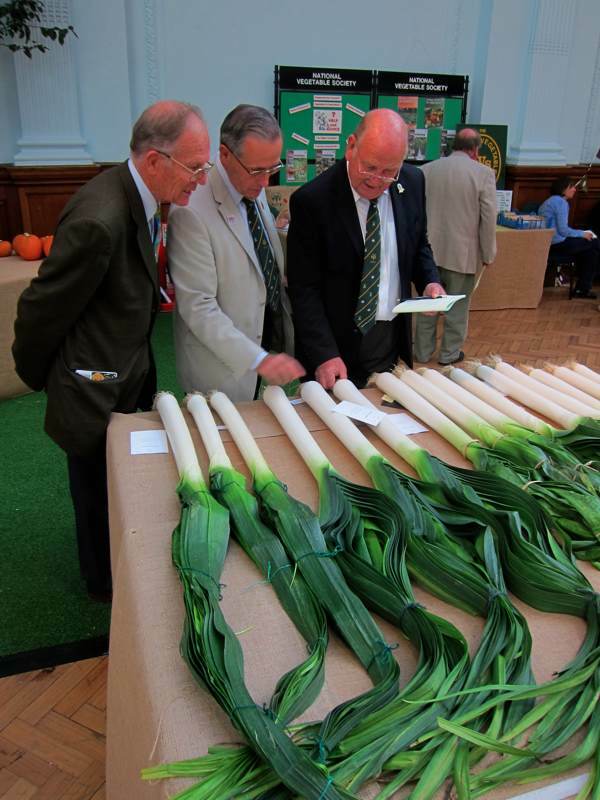 In hushed tones, I heard the accents of the English regions exchanging excited comments of anticipation, as our nation’s leading horticulturalists examined their competition respectfully and took each other’s photographs with their magnificent vegetable specimens. All year, through the spring and summer they had tended their beloved charges and now the moment of reckoning was upon them. 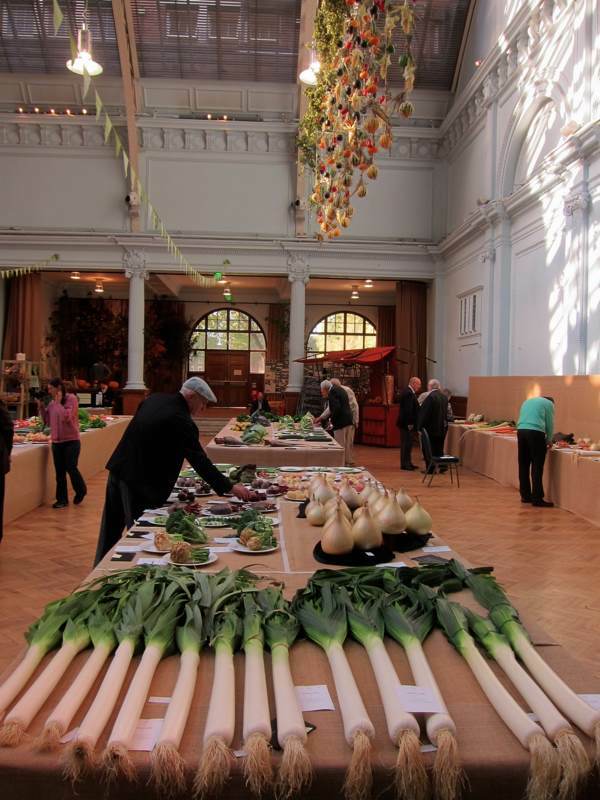 There is an undeniable surrealism to these superlative fruits, the longest leeks, carrots and parsnips, the largest onions and heaviest pumpkins. Yet the innocent delight these glorious monsters draw from bystanders who come here to wonder is an expression of the universal human affection for all the fruits of the earth that sustain us, and a visit to the Lindley Hall to see the Harvest Festival is a joyful experience of religious intensity for anyone who cherishes vegetables – such as myself. 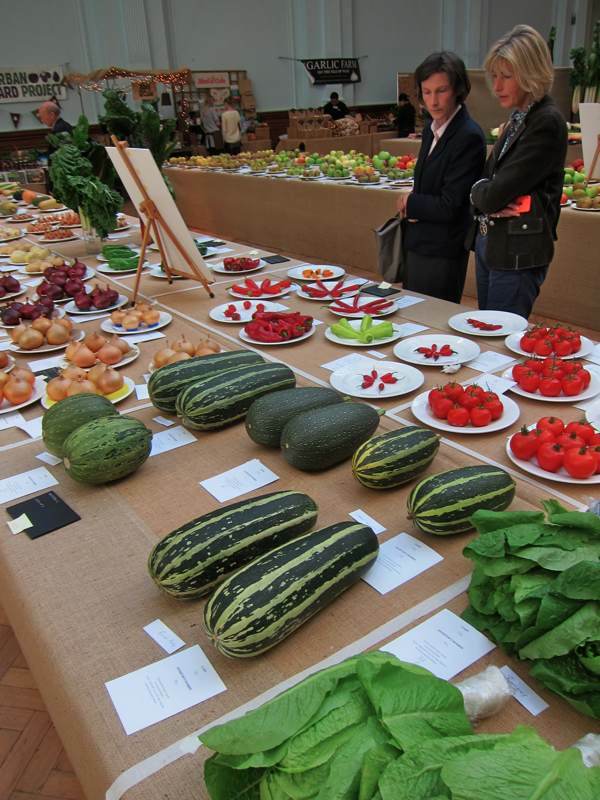 The puzzling irony for the casual visitor is the table of rejects, each example labelled with their particular incriminating flaw while simultaneously possessing the redeeming appearance of high class produce in every other respect. 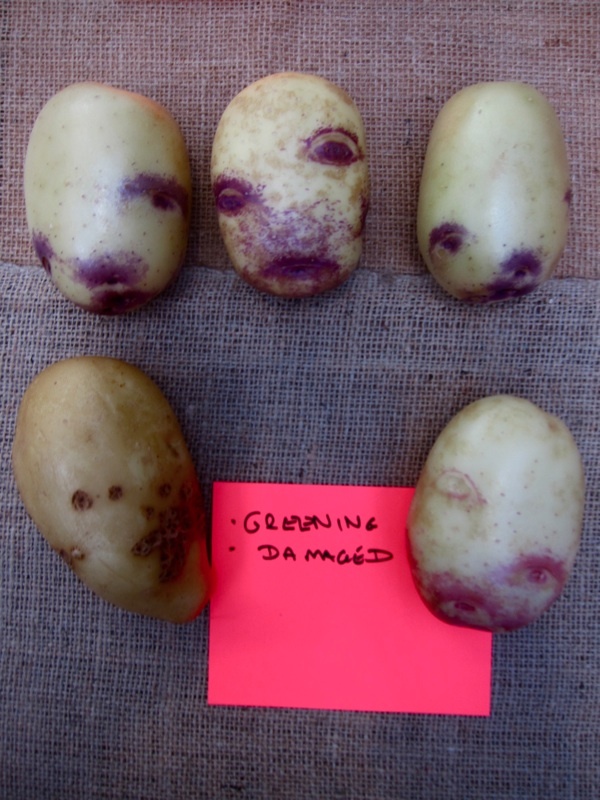 As mere mortals, disregarding the professional pedantry of the judges, I think we may forgive these trifling imperfections in the light of their other admirable vegetable qualities. Thanks SO MUCH for a lovely, but important aside from the busy workaday world. Isn’t it just amazing that all those miraculous things can appear almost entirely on their own from just plain dirt? 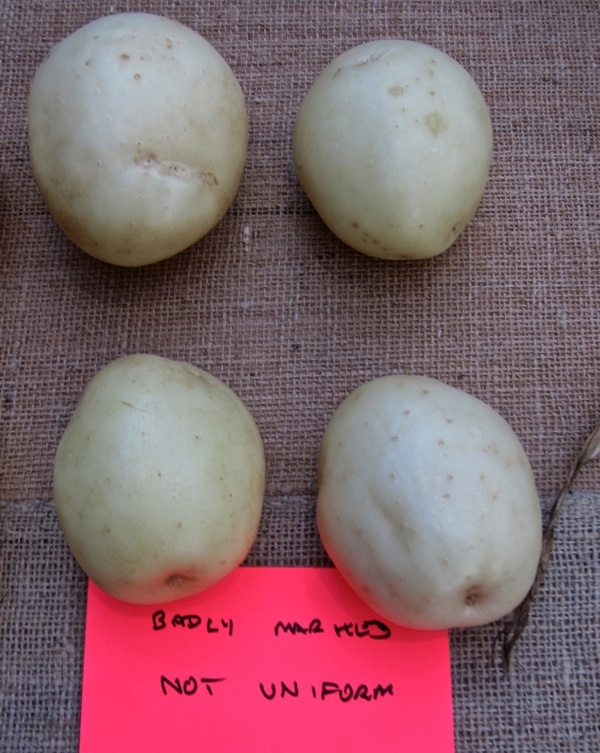 I suspect the judges overlooked the faces in the potatoes (third photo from the last). 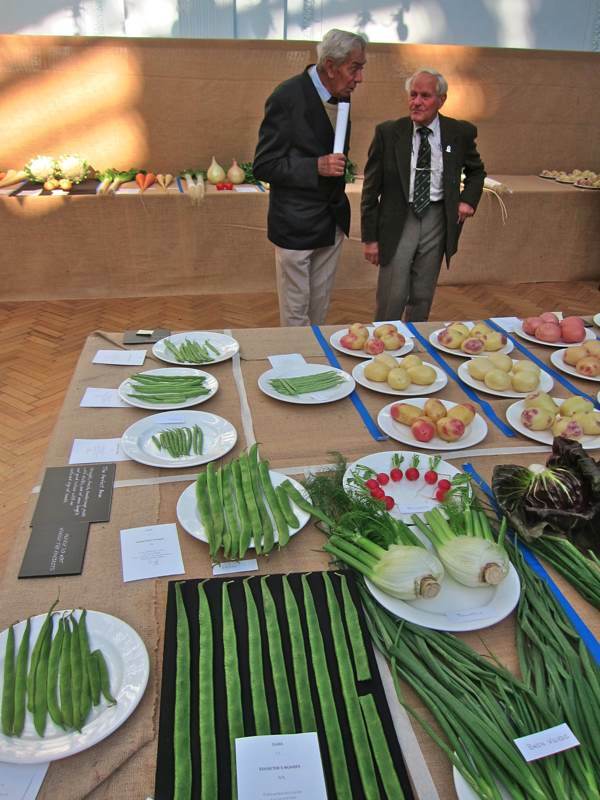 Otherwise they’d have felt compelled to award prizes instead of critiques. Oh wow! 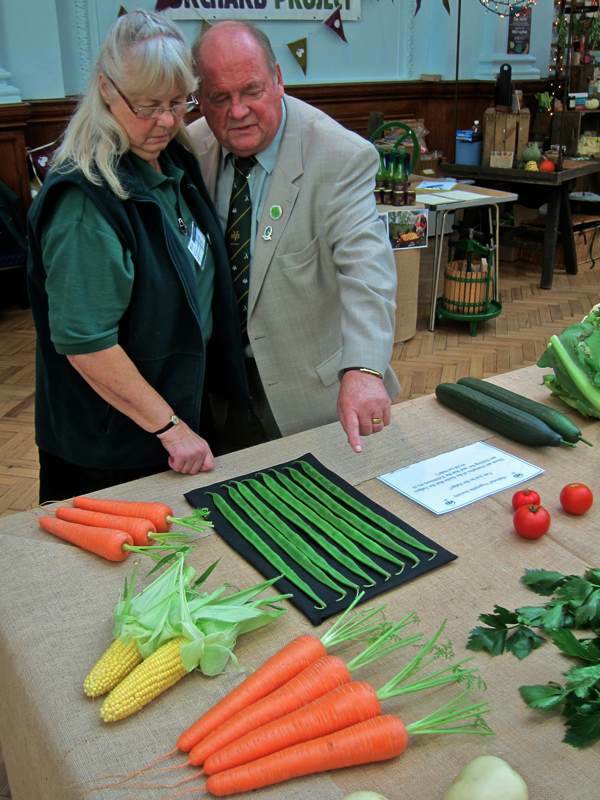 The veg with faults are better than what they put into our local supermarket. Even the quality in the best vegie man in the area doesn’t match it. Do they sell it all off at the end? ha! a far cry from our 4-H competitions over here in the states. 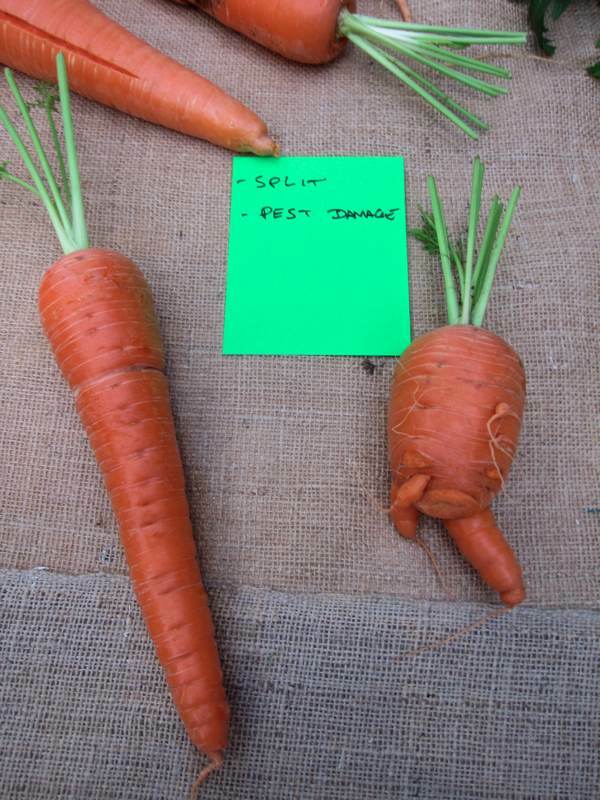 can i suggest you rename the post: “the shaming of the carrot”? 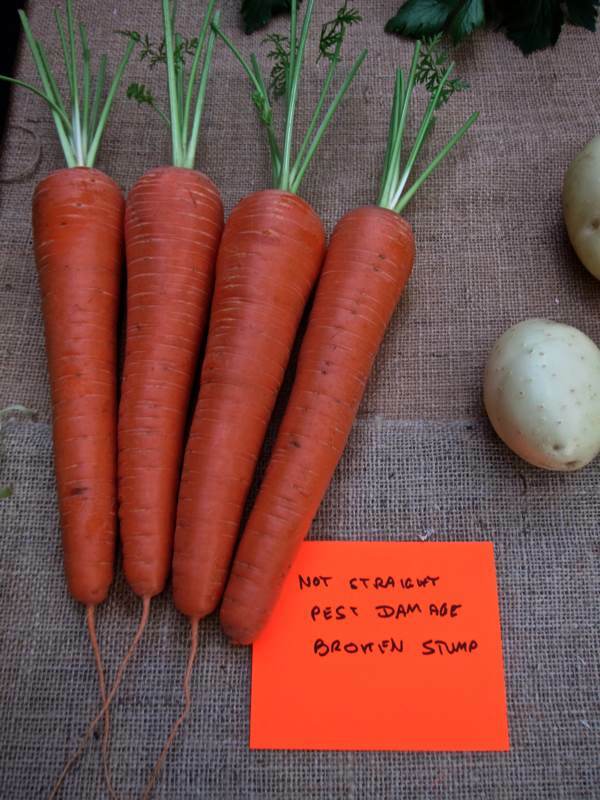 poor little old veg! 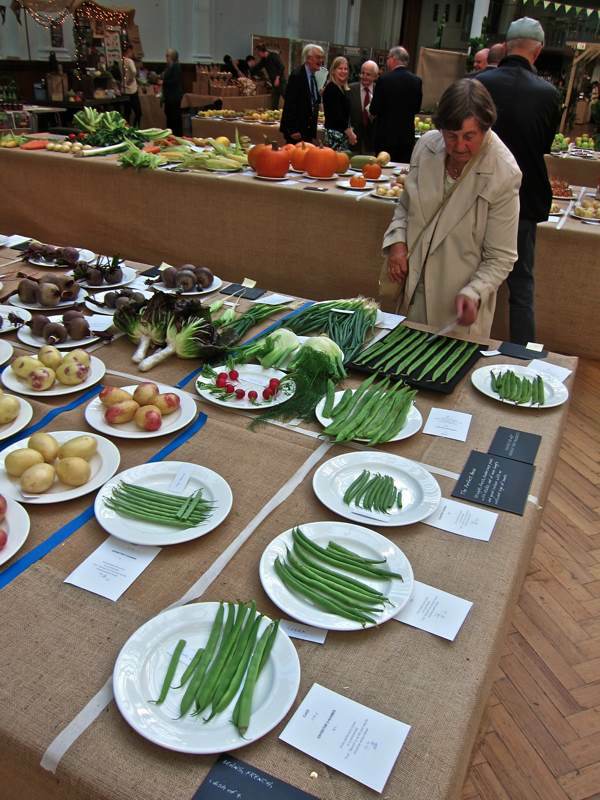 Love fruit & veg shows, they’re so…human! How delicious they all look. Being a vegetarian I’d have happily cooked any of them, broken stumps, bad necks, uneven etc., they’d all have made lovely meals. 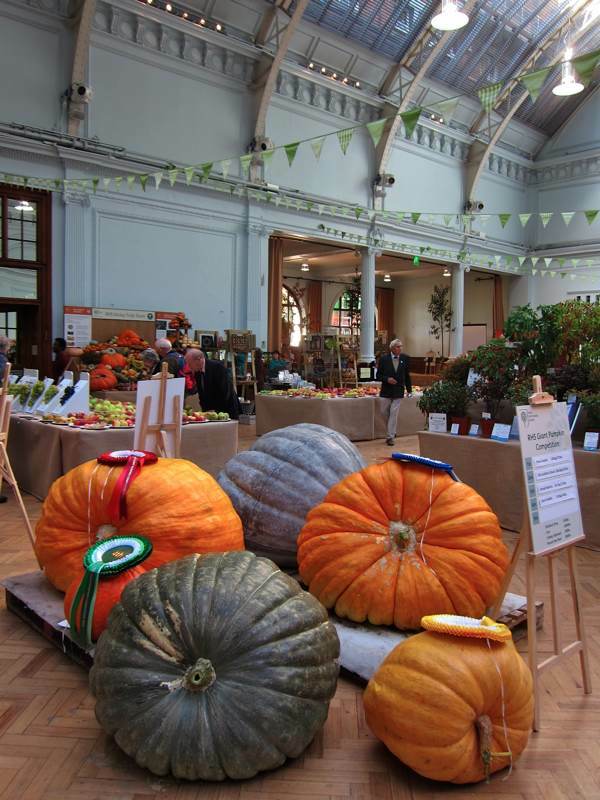 I greatly enjoyed waking up to reading about the RHS harvest festival. Wish I could make it to the second day but work means I can’t sadly. 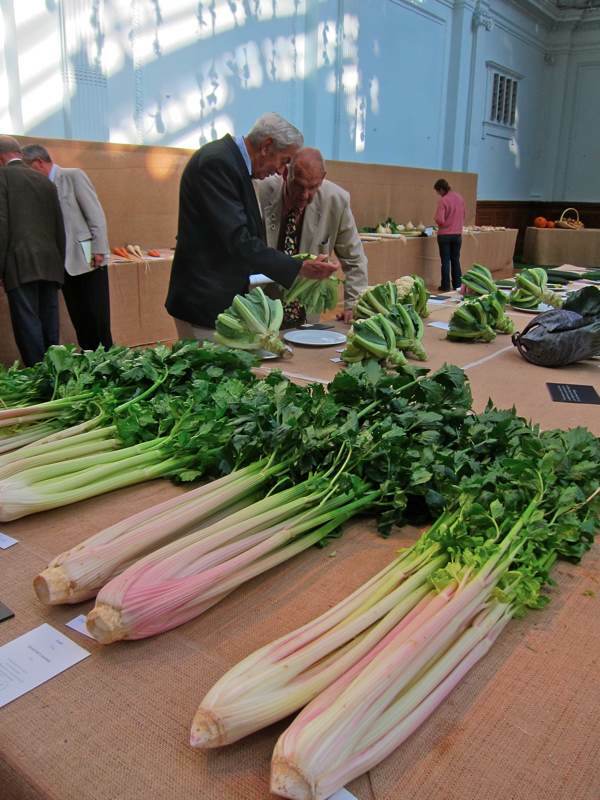 Below the cauliflowers in “considering the cauliflower” photo there are some giant pink tinged vegetables which look a bit like celery. 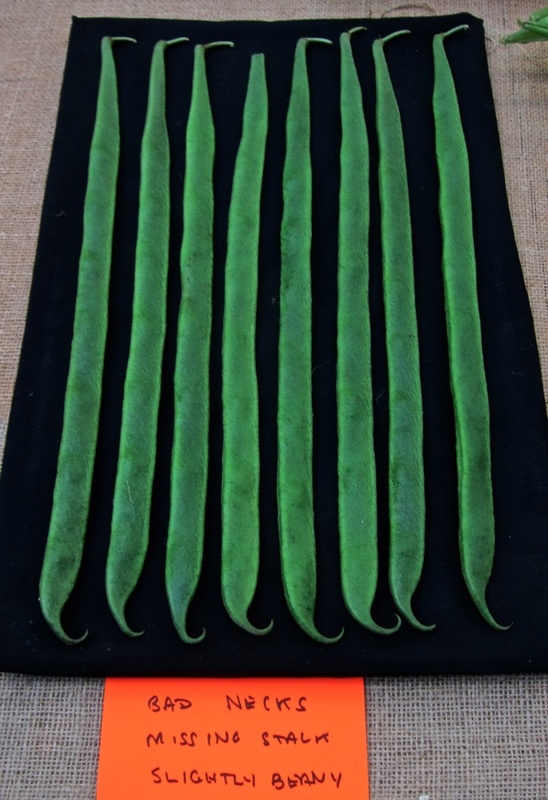 Just wondered what they are, if anyone knows? Were there no young people there? I hope at least local schools go and see… But also, no mobile phones or tablets in any of the photos; just pens, paper, post-its – wow! About as rare these days as a 10lb onion. The failures are indeed fascinating. I try to visit the Foire Saint Matthieu in Houdan, France, every year; it goes back to 1065 and includes a fun fair, car boot sale, and agricultural show, with a special focus on poultry and rabbits (Houdan is home to the Houdannais breed of chicken and the Faverolles chicken comes from a few km down the road). While the champions and the 95% scorers are splendid birds and beasts, I always enjoy looking at the Salon des Refusés, or in this case éliminés. Uneven crests, missing tail feathers, spurs where they shouldn’t be, wrong coloured plumage; fur that’s not crinkly enough, too crinkly, the wrong colour; ears the wrong length or with the wrong coloured tip or that flop too much. And best of all, the lièvre nain (which despite its name of ‘dwarf hare’ is in fact a rabbit) which carried a sign saying, in angry capitals: ‘Standard belge non reconnu’ – Belgian breed standard not recognised. This was after all the country which invented chauvinism! Wonderful! 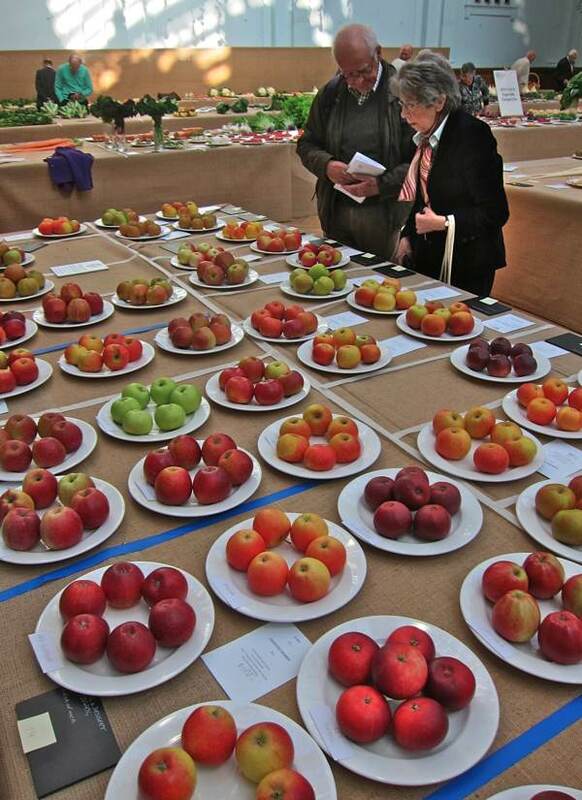 But think of it: there are hundreds of varieties of apples, but least of them you can buy — unfortunately! 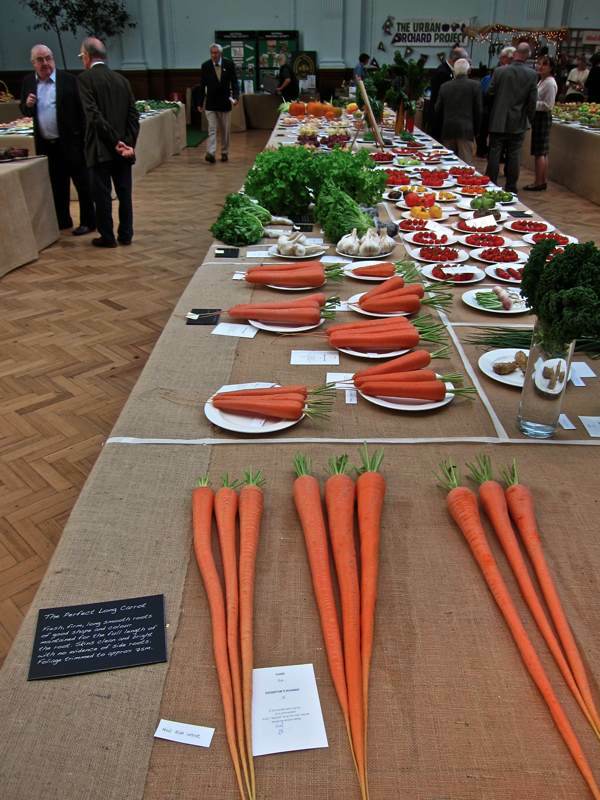 Standards have slipped from the produce shows in my youth, for an exhibitor to submit a split carrot to a major event would have been unbelievable in those days. These photos were a delight, but then all the sequences you show are fascinating. 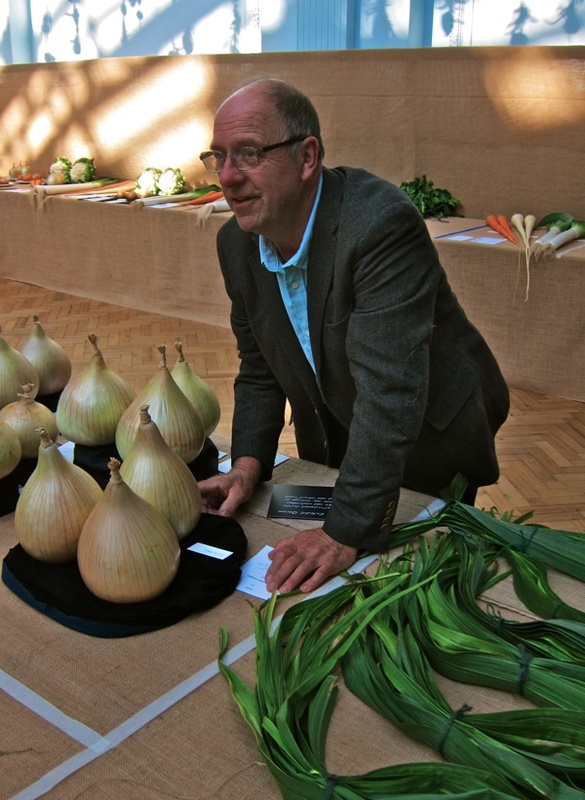 I wonder if you know ‘The Plant Kingdoms of Charles Jones’ published by Thames and Hudson in 1998. 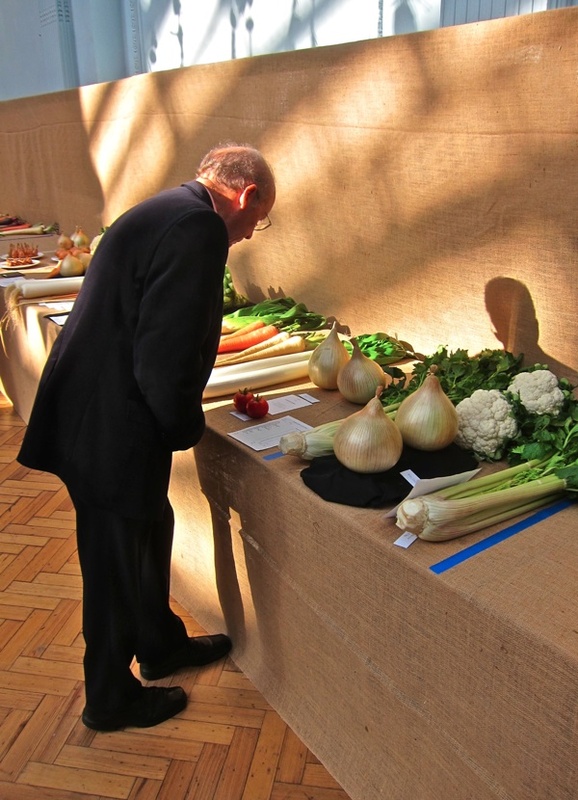 Charles Jones’s black and white photographs of vegetables and flowers are wonderful portraits, found in a trunk in Bermondsey Market by Sean Sexton in 1981. They were gold-toned gelatin silver prints made from glass plate negatives. Apparently Jones (b. 1866 in Wolverhampton) at one time offered in ‘Popular Gardening’ to take photographs of people’s gardens for half-a-crown an image, but none of these are known. Towards the end of his life he used his glass-plate negatives as cloches to protect his young plants, and no-one knows where any of his negatives are if they still exist. 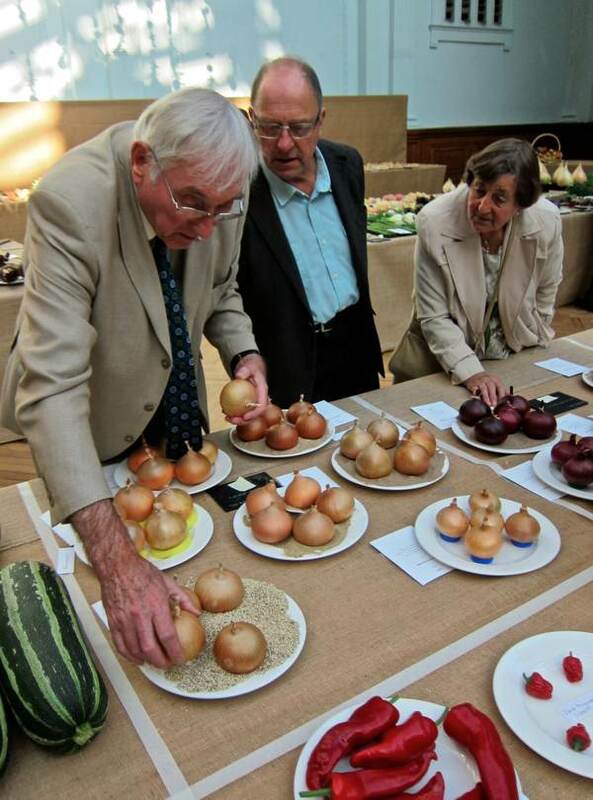 I too have photographed vegetables and flowers, in fact the whole joy of the country horticultural show, in black and white, and they were a feature in ‘Country Living’, but Mr Jones’s photographs take my breath away. Yours delight me too. 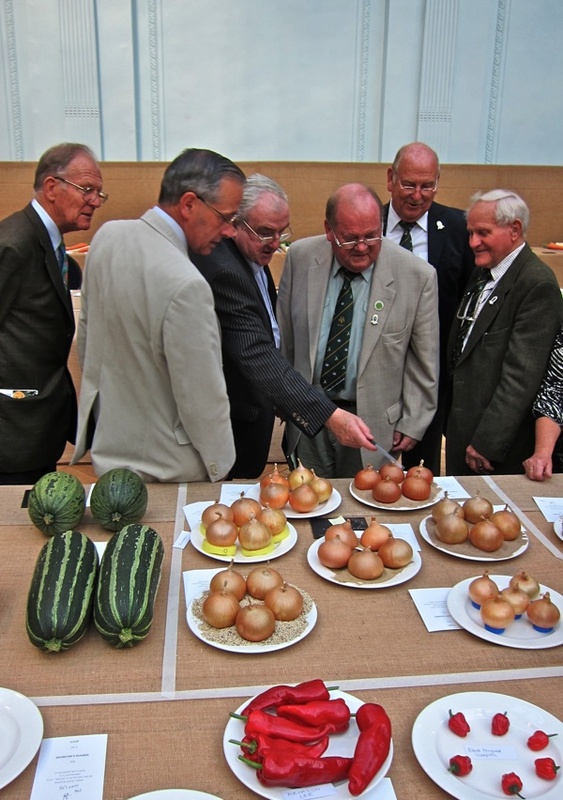 I love the picture of the giant pumpkins, wearing their prize ribbons like tam-o’-shanters. Thank you so much for showing me where you have Charles Jones’s photos already on the internet. I have sent them to a friend, but she receives your emails regularly so she may already have come across them. Damaged goods but what do they taste like? 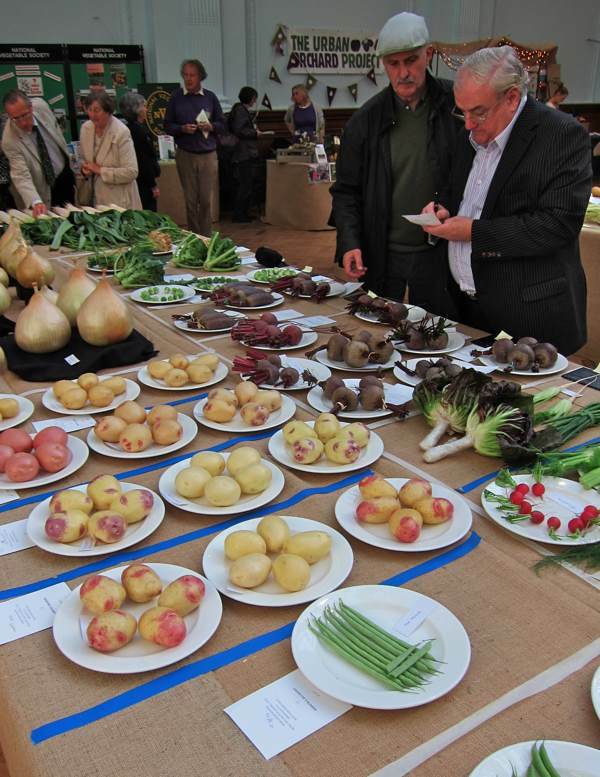 Unfortunately the supermarkets prize appearance above flavour and while it’s good to see such bounty one can’t help feeling that the criteria for judging are not complete. 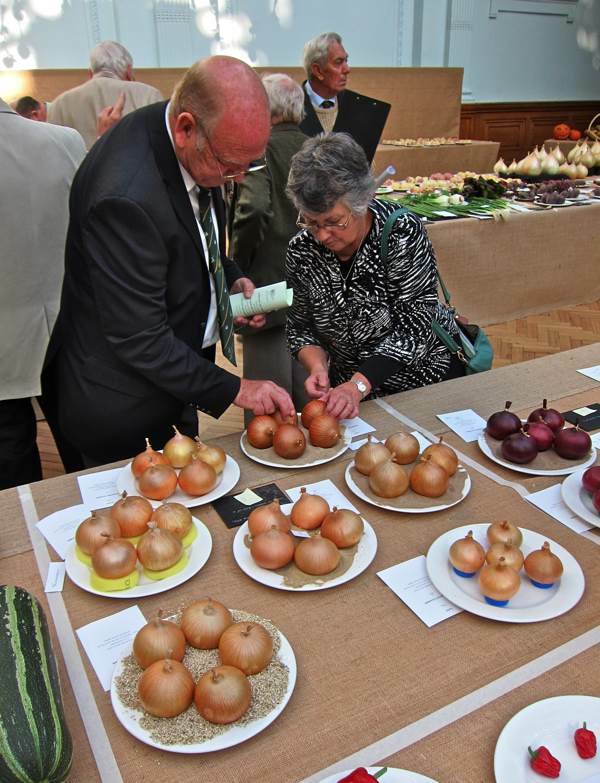 On the other hand I’m jealous of the onions – I grew some in our cold, wet, heavy Pennine soil. No prizes for guessing what happened. gorgeous photos. inspired to photograph the rejects! 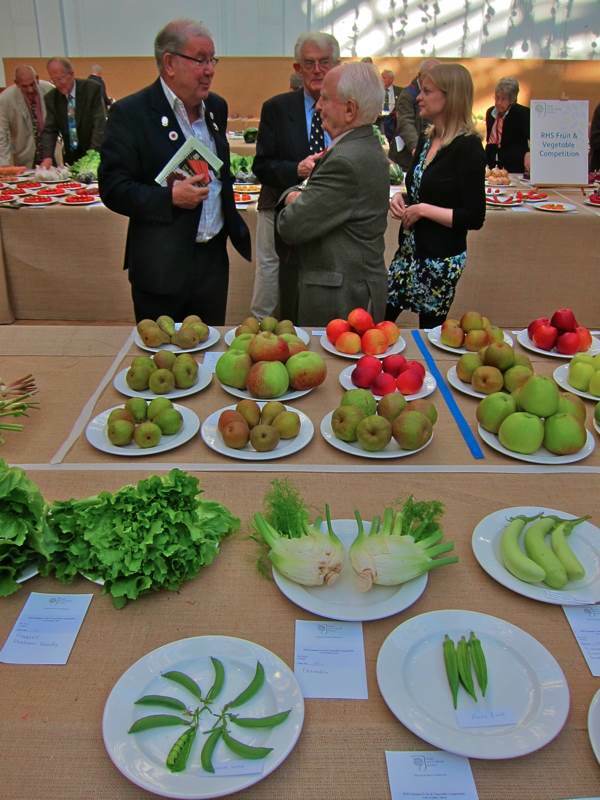 Was that Basil Fawlty assessing the beet root?